Exilator provides passive exhaust purification systems that eliminate odours and reduce nitrogen oxide (NOx) and noise emissions on maritime vessels. The ExiLencer™ is a passive exhaust purification system featuring a number of technologies, including a silencer, ExiBlock™’ ceramic blocks with a Nasa-developed coating, and a specialised NOx catalyst. ExiLencer eliminates 98% of black soot and 99% of carbon monoxide in exhaust systems, as well as reduces noise emissions by 35dB, and NOx content by 20%. The solution’s specially designed inlet section keeps static pressure low and ensures an even distribution of flue gas in exhaust systems. The system continuously ignites and burns black soot while exhaust temperatures are higher than 325°C. It is suitable for four-stroke diesel engines using low-sulphur fuel oil, but can be optimised based on engine size and performance. ExiLencer’s patented and coated ExiBlock ceramic blocks allow it to automatically regenerate and burn soot at lower temperatures (325°C) when compared with conventional exhaust gas purification systems. The ExiBlock units are clad with ceramic mats that allow flue gas to flow past, enhancing the efficiency of exhaust systems, reducing mechanical stress, and ensuring the units are correctly fastened. This results in higher durability, even in adverse weather, and a significantly longer service life for the ExiLencer. The blocks only require cleaning once a year or after 5,000h of operation, and can be re-used ten to 12 times over a lifespan of more than 50,000h. The ExiLencer comes with the ExiBox real-time monitoring system, which keeps engineers informed about system performance via a standard PC display installed in engine control rooms. The ExiBox continuously monitors important exhaust gas parameters. If limits are exceeded, the system transmits an alarm via fixed wiring or remotely to the crew. Data is stored locally to ensure real-time and historical records are always available, but can also be accessed remotely. With no active parts, the low-maintenance ExiLencer system minimises mechanical wear, and can be optimised based on vessels’ engine size and performance. 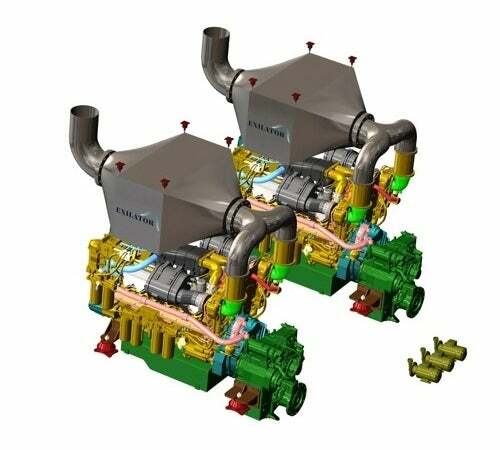 For example, the suitable ExiLencer size for an 800kW drive motor with a maximum permissible static pressure of 10kPa is achieved with eight ExiBlock units. With additional ExiBlock units, an even lower static pressure (less than 3kPa) can be achieved. The ExiLencer is made of American Iron and Steel Institute (AISI 316) stainless-steel, which provides high-resistance to mechanical stress and corrosive environments generated by the flue gas. The various components of the ExiLencer have been successfully used in trucks, buses, off-road and heavy-duty vehicles, as well as diesel cars. The ExiLencer can be installed into new-builds or retrofit vessels to improve comfort and reduce operation costs. In addition, upgrading used yachts with the exaust purification system can improve its sale price. Exilator also offers financing to allow owners and charterers to use it immediately but pay over five years as part of a service contract. The solution has already won Green Ship Technology award and was in the final for Lloyds List Maritime Engineering Award.